[Simon] is in the middle of restoring/building himself an Austin 7 Special out in his garage, and like most tinkerers, found that music helps to move the process along. He happened to have an old Bakelite generator phone out in the garage as well, and figured that he might as well have it do something other than simply hang on the wall. 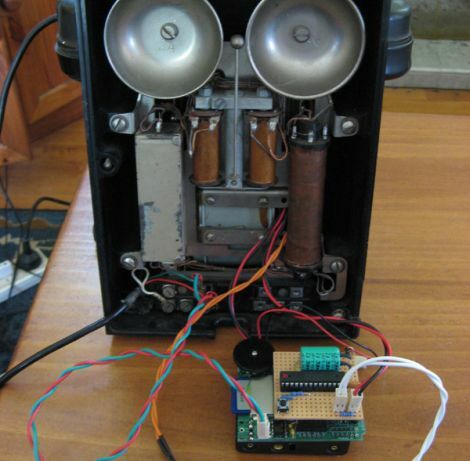 Playing music from the 1930 seemed like a fitting enough task, so he picked up an Adafruit Waveshield and spent some time wiring it up to the old telephone. His new radio works simply enough, piping .wav files through the handset, provided someone has cranked the phone’s generator recently. While cranking the generator is required to play music, the Arduino is actually powered off a pair of AA batteries. The cranking is all cosmetic, but he did program the Arduino to slow the music down every once in awhile, requiring that the generator be turned to get things back up to speed. It really is a neat way to repurpose the old phone, and we like the fact that [Simon] did not gut it to put this project together. Continue reading to see a short video of his new music player in action. This seems nifty, but it seems his time would have been better spent working on that car. +1 for a write up on his car. Yes, HaD a day got that bit a little wrong (or my write up isn’t clear). It’s not for ME to listen to. It’s for everyone else who comes in and they all want to pick up the phone to see if it works. I do spend most of my time working on the car. It’s a slow process though. Generally limited by funds not time. I don’t listen to the radio when working on it or put radios in my cars. I like to hear the tappets! Ironic then that it is an auto… tune. Hmmmm food for thought. Cute hack, I like it. Waves–ah, what a refreshing thought and the greatest music of the last century. I hope it’s hot rather than sweet. Our store and shop have antique dial phones on a 5 station system. It was a hoot the other day when we watched a new part-timer try to push the holes in the dial to call the office from the shop. How did you make the Arduino slow down the song? Sorry for being a n00b. I’ve never played with the Waveshield but if the Waveshield has a way to tweak the sample rate you can achieve slow or fast audio that way. Also you can slow down the digital audio by extending the time in between sending the wave data or send the same bit of data over and over again stretching the sound out that way.